Jatamansi is a tonic and used for treatment of wide variety of ailments. It is useful in treatment of diseases related to nervous system, heart, gastric disorders, seminal debility etc. Jatamansi is an extensively used medicinal herb of Ayurveda. Its botanical name is Nardostachys jatamansi and belongs to family Velirenaceace. This medicinal herb is found in sub-alpine Himalayan tracts at height of 3, 000-5, 000 feet and also in Nepal, Bhutan, and Sikkim. For the medicinal purpose root rhizomes are used. 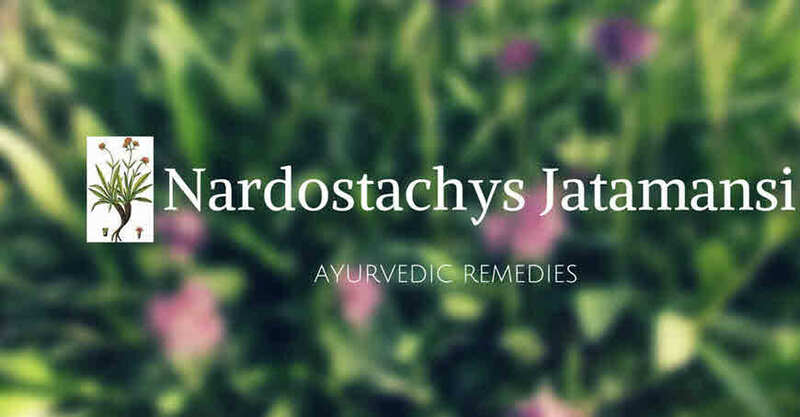 In Ayurveda, the root powder of Jatamansi is used as neuroprotective, stimulant, antispasmodic, antipyretic, and antioxidant. It is recommended for treatment of various neuropsychiatric illnesses and excessive thirst. Latin name: Nardostachys jatamansi (Jones) DC., Patrina jatamansi (Jones) D. Don, Valerianawallichii DC. Plant description: an erect perennial herb about 10-60 cm in height, with long stout, rhizomes root. The radical leaves are elongated and spathulated, while few cauline leaves are sessile, oblong or sub-ovate. Flowers are rosy in dense cymes, with pale pink or blue in coloration. Jatamansi is a tonic and used for treatment of wide variety of ailments. It is useful in the treatment of diseases related to the nervoussystem, heart, gastric disorders, seminal debility etc. Jatamansi is safe to use if used appropriately. Root powder infusion of Jatamansi is useful in the management of mental disorders, insomnia, and disorder of the blood and circulatory system. The roots of Jatamansi plant are bitter, sweet, astringent-cold-pungent and balances all three doshas. On oral administration, the root powder works on blood and nerves. The main effect is on circulatory, nervous, digestive, respiratory and reproductive system. Jatamansi is nervine, tonic, Hypnotic, CNS-Depressant, Sedative, Tranquilizer, carminative, deobstruent, Aphrodisiac, decreases the heart rate and hence used as antihypertensive. The root oil is applied on hairs for growth and blackness of hairs. Herbs are great gift from god. These are completely natural and easily available. Numerous studies supports the traditional medicinal uses of herbs. Here are given few remedies that can be done at home for treatment of diseases. Jatamansi has blood pressure lowering effect. It is also possess Tranquilizing and sedative effect on the brain. So this medicinal herb is mainly indicated in the treatment of nerves, brain and heart ailments. For management of hysteria, convulsive affections, palpitation of the heart and in intestinal colic the infusion of root powder is taken few times a day. For this purpose take one-fourth teaspoon of root powder and make infusion in five glass water. Filter this and drink one cup three times a day. Jatamansi is also indicated in skin diseases. It is used externally on the affected skin area. For hyperpigmentation, mix root powder with neem oil and apply on the affected area. Jatamansi oil is a useful medicated oil which is applied topically to treat hair related problem. For making medicated oil of Jatamansi, take one part root powder and 10 part coconut oil. Prepare the oil and apply externally on hairs. Hypertension is a condition of elevated blood pressure. Jatamansi has hypotensive effect and hence used for treatment of high BP. For this purpose take one pinch of root powder and mix in one cup hot water. Drink this infusion 2-3 times a day. Prepare a root paste and apply externally on the body. Safe recommended doses of Jatamansi root: Root powder 2-3 g, 5-10 g for infusion, 50-100 ml infusion.